David was born in Mussoorie and lived in India till he was 18, parents working as missionary admins and teachers. His Hindi helped in many ways, would have been a good but different trip without it. Always amusing to see people’s faces when he spoke. This was my first trip to India. His 5th since leaving in 1970 and second bike tour there. We started in Shimla, rode through mainly Himachal Pradesh state and finished in Dhariwal, Punjab state. 1216kms, 60,600 +/- ft elevation gain, 70,500 +/- ft elevation loss/descent. Temps ranged from below freezing to over 100deg F, and only rained about 8 days total. Sept 10-Oct 18, 2015 which was after monsoon season and before winter snows moved in. About $3300 for 2-1/2 months travel including $1200 flight. India is fairly inexpensive if you stay out of the Western style hotels and tourist places. Big cities cost more of course and most of Himachal Pradesh is very inexpensive. I splurged on some beers, a massage and a couple nice dinners, plus some gifts for my daughter, but I didn’t overspend and came in at 75% of my budget (sold my motorcycle). David had two hospital trips (Rekcong Peo, Manali) for an inhaler, anti-biotics and cough syrup and drops, some gut issues in Chitkul and Basunti, lingering chest congestion from wet Holland. My gut issues were after the bike trip while in Dhariwal and in Mussoorie, one hospital trip (Arpana Ashram) for anti-biotics/antidiarrheal meds. On the trip only had a cold in Chitkul/Sangla. No accidents but many near misses. Mine was a unsuspended 26″ wheel 1990 Novara Ponderosa I bought for about $180 and had Corey Thompson add S&S couplers, change to 1-1/8″ stem and a few other additions. Ran a packless system with a Nitto R12 rear rack to strap street shoes and dirty clothes on. Schwalbe Mondial marathon tires and Jones 710mm H-bars. Original 3×7 Shimano Deore drivetrain, hubs and canti brakes from 1990, Suntour brake levers and thumb shifters. Gearing was 46-34-24 and 13-15-17-20-23-26-32 hyperglide. Rebuilt wheels with new spokes, same 1990 era rims. Homemade coroplast fenders zip-tied on (fenders highly recommended – mud, feces from everyone, dead animals and other debris). No computer/GPS. Bike name is Khojana Wala, in Hindi it roughly means “the one who helps you get lost” or “the scout who helps you search”. Weighed about 31.5lbs without bags. 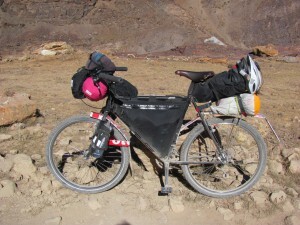 David had a custom Hinderyckx unsuspended 26″ wheel S&S bike with similar setup except a small Tubus rear rack and Arkel narrow panniers instead of seatpack. Front rack, generator hub for charging devices. He opted for drop bars, bar end shifters and 3×9 gearing, 46-24-24 and 14-15-17-19-21-24-27-30-34. Both bikes worked flawlessly with only one light cleaning and some sporadic chain lube. No mechanicals (save David’s chainring bolt), no flats. Flat pedals and hiking shoes?